Building a cat condo (& making sure both use & love it) was my requirement for getting the new couch we needed after the move. (Our cats destroyed the last 2 couches) They absolutely love this condo, but are never on it together unless 1 is pushing the other off! 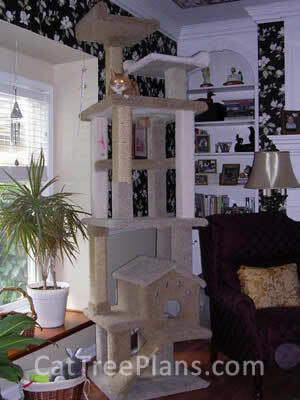 The bengal actively protected his octagonal "throne" for 6 months & loved being silly by going round & round the post. The black one has finally won his way to the top recently. In the process of making this VERY sturdy piece of furniture, we discovered that they prefer to scratch on carpeting, not sisal. Next one will be 100% carpet. Thanks for the awesome plans. Many thanks for the plans. Our master has found them were very clear and easy to make. Thank you so much for the speedy reply to my question. 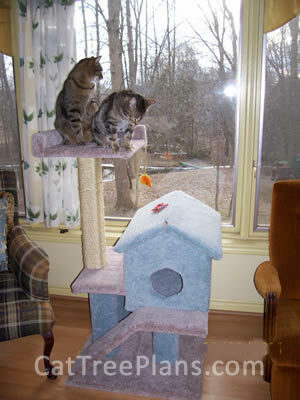 Enclosed is a photo of Tigger and Tabby on their new Rum Tum Tugger Resort. They love looking out the window from the top perch. My older cat Tabby has a habit of wanting to hide when he knows he is heading to the vet's, so I added hinges to the roof so I could have easy access to him should it be necessary to get him out. I am already planning to build an addition to the resort. 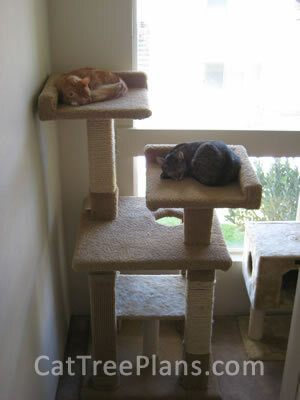 With 2 cats, we really need 2 perches for them. 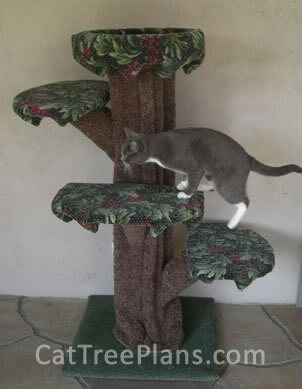 I finally finished my first cat tree... yay! Took me a long time because the hand stapler just didn't cut it, and it took me a while to find a good power tool. I finally settled on a small pneumatic finish nailer / stapler. I love that thing! Anyway, here's a picture of the finished tree, and of my Buddha loving his new perch by the window. 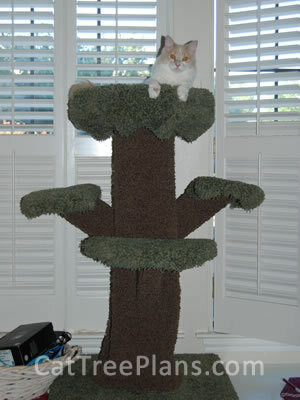 This is our cat Flopsey, on her tree, which she loves. She spends most of her time on the top perch looking out the window at the birds. 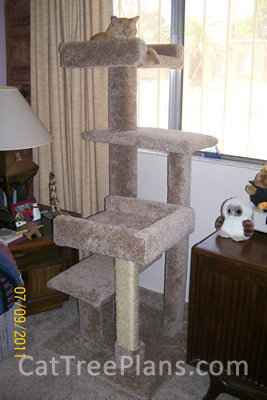 We changed the perches to make them square, and closed on 3 sides. The plans were so easy to follow, and we are working on another one for her for our screened in patio. 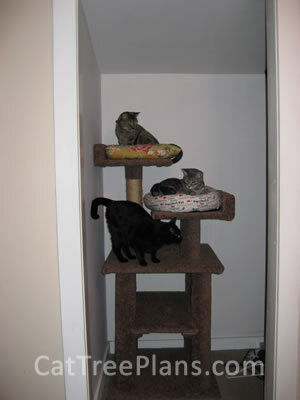 Here is a picture of the cat condo I built off you plans. Thanks again. This is my 7 month old kitten named DAISY. She really enjoys her new house. Her Mom and Dad like seeing her so happy in her own place. Daisy feels like a princess in her own castle! 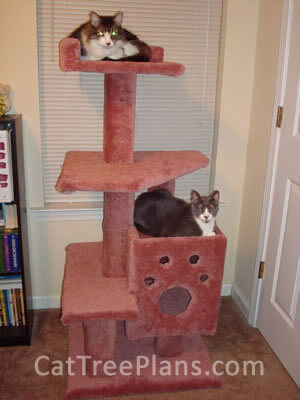 Your plans were great showing step by step illustrations on how to build with the measurements and also a shopping list for all the materials needed to complete the cat tree. 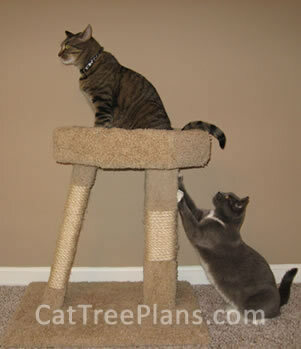 We will recommend your company and plans to all our cat friends! A big thanks for the plans. 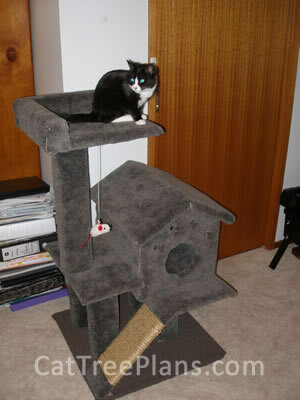 I received the cd yesterday but I had already finished my cat tree using the pdf file for the Mistoffolees Castle. I've attached a couple of pictures. 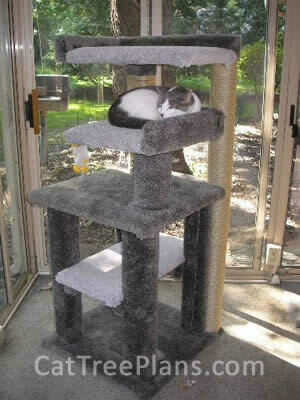 It was a great success as my cat Max has explored every part of it and enjoys viewing the outdoors and sleeping on it. I did modify it a little. 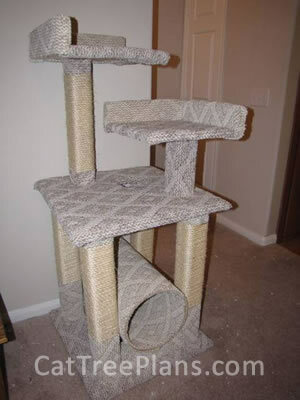 My cat loves to climb so I added a scratching/climbing post on one corner, that's was a LOT of sisal rope, and extended the top perch over to meet it. 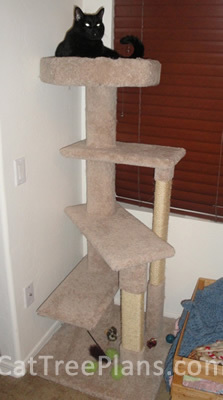 I'm very happy with how sturdy it is and of course the savings in dollars by doing it myself. I might have to make another plan now for my son's cat. 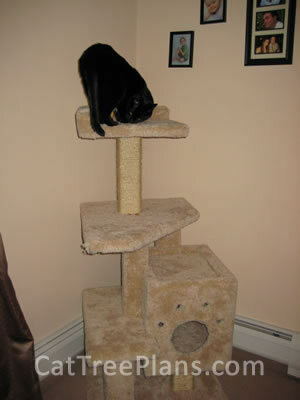 Sammy loves his birthday present, a few treats to get him used to it and now hes there 24-7. It only took a day to do and the directions were easy and the materials were cheap!! 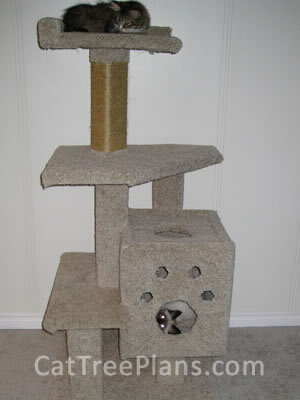 The kitty won’t be born for two months, but she already has a cat tree. As others have done, I modified plan two using a tubular concrete form. Thanks for the great plans!!! They made construction a snap! Thanks for the help, as you can see my cats love it. 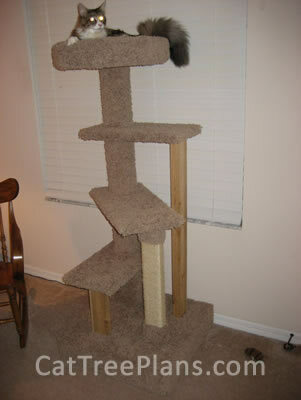 This is "Cooper" checking out the Shimbleshanks Tree House that my friend Jackie and I completed today. Your plans are awesome and so easy to follow. Since ordering the plans about 2 years ago we've made all the trees and given them to family and friends who are just blown away at the quality and sturdiness. The more we do the better we get, and they're so much fun to make. Thank you for providing us a great hobby! As you can see Pie (top) and Piper (bottom) love their window perch now too! This is my second project and again the plans were detailed and very easy to follow. Again I highly recommend purchasing these plans. Thank you! Love the plans! Took us less than two days to finish the castle! Can't wait to build more. 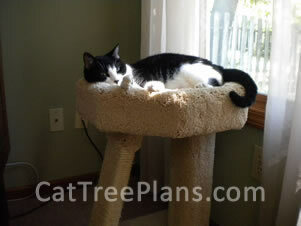 Thank you for putting together these cat tree plans. The tree looks great and the plans were easy to understand. Sebastian (top) and Tippy (bottom) love it! 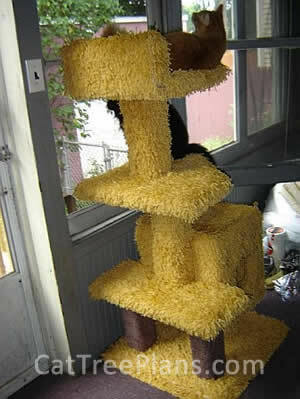 The cat condo was easy to build from your plan. Kitty-Kitty loves her new place. That's Fuzzy on the left and Lucky on the right. 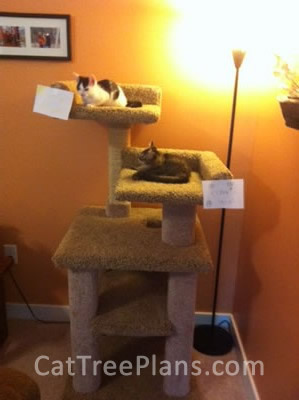 They love their christmas present. As you can see my husband used plans one and two. He had everything cut and put together in just one weekend and I helped with the carpet. It was fun and easy to build. We are so glad they like it. It's fun to watch them play on it. We are thinking about making more and selling them as a hobby. 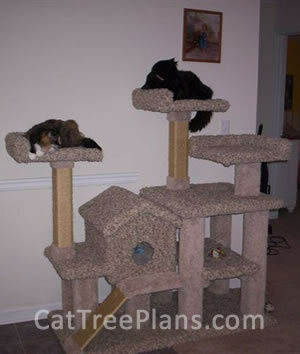 Your plans were very easy for our mom to follow and we love our new tree. Many thanks. 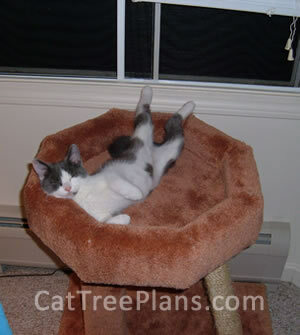 The cat tree is great! Molly loves it. 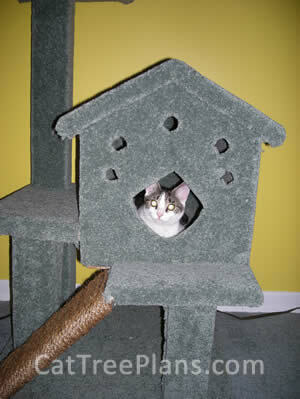 My cat Michino loves his Shimbleshanks Tree House. It was a lot of work but completely worth the effort. When I brought into the house he sniffed it a bit and gave it a walk around and quickly climbed to the top of the perch. Every night he goes to sleep in his tree now. 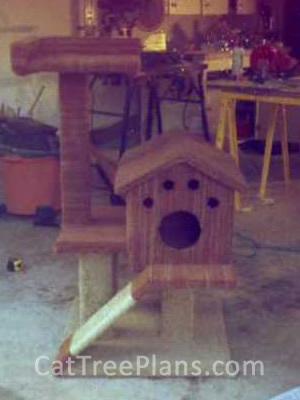 Great plans and I will attempt another tree latter this month. Here is a pic of our tree (and our kitty) He was all over it before we were done! Thanks for the great plans. 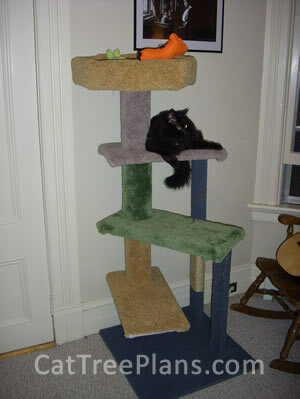 I finished building a cat tree. 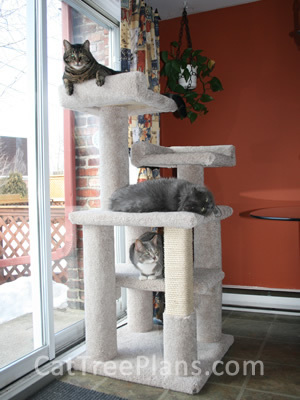 Shampoo and Nacho love the cat tree plan 4 that I made from your plans. I think I'll build them the resort next. My husband combined two of the plans with a little modification and here is the results. 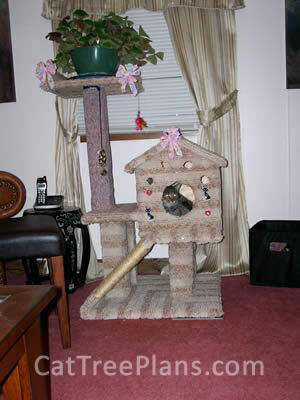 We built it mainly for our two kittens,Quincy and Poppy, but our 3 older furballs love it too. It's pretty funny to see 3 or more of them just hanging out! This tree stands 8'6". It draws a lot of attention from visitors.